Born in Brittany, the Celtic province of France, raised mostly in rural North Carolina, and a traveler through Spain and Latin America now living in Washington, DC, Alex has always sought to create music that expresses his unique confluence of world cultures, what he calls “New World jazz.” A former novelist and poet with an MA from the Creative Writing Program at the University of Texas at Austin, he seeks to make music that tells stories of the exotic and the familiar--the “exotic” always being familiar to some of us. He found an ideal vehicle for this effort in the quartet Amérique Latine, formed with vocalist Lena Seikaly (of Palestinian descent), bassist Leonardo Lucini, and drummer Alejandro Lucini (brothers who grew up in the Copacabana neighborhood of Rio de Janeiro). The group’s CD, Nostalgia for Terra Incognita (2007), navigates the waters where these cultures meet. 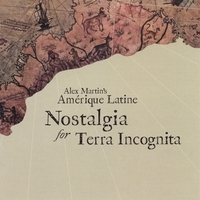 Nostalgia includes six compositions by Alex as well as five standards from the U.S., French, and Brazilian repertoires, approached from the group’s distinct perspective on the musical world. The result is an attempt to map the group's own Terra Incognita, a land of memory and imagination. I live in Paris and hope Alex Martin andhis band will tour through France soon. I especially love the songs Occaneechi and Pas de deux des Frangines, but they are all great. Can't wait for the next album! Luc Ponty) but this is so nice, the chording is refreshing, the vocals superb, bass is so right, percussion excellent. The music as a whole evokes a peaceful yet thoughtful place and time. Keep it up!